With the title taken from Randall’s forthcoming book Teaching America How to Letter: Ross George, William Gordon and The Story of the Speedball Textbook, this exciting presentation details the history of American commercial lettering, the birth of the Speedball pen, and the emergence of the Speedball textbook as a force for the training of letterers worldwide in the 20th century. It was originally introduced at the International Lettering Arts Conference “A Show of Hands” in 2016. With roots in the industrial revolution, the emergence of the department store, and the development of advertising techniques, the show card industry developed into a high demand profession in the early 20th century. The American card writers developed distinct styles with rapidly written copy that had an effect on commercial letterers worldwide. The development of the Speedball pen, a tool with a bent nib, facilitated even more speed in writing hand-lettered advertisements. 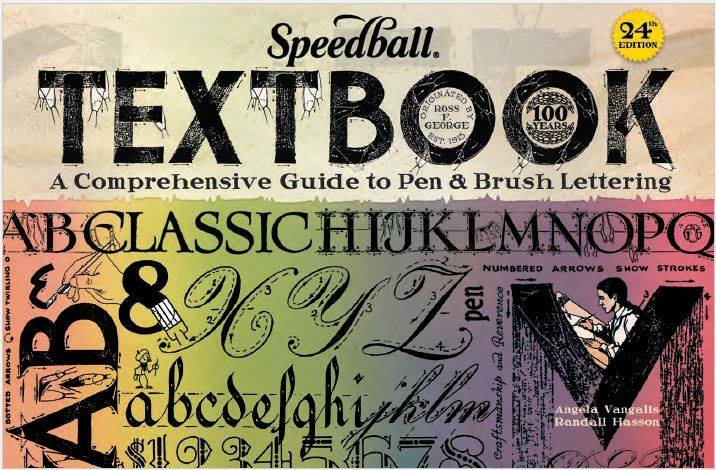 The Speedball textbook, originally produced to help letterers learn to use the pen itself, evolved into an indispensable part of the fabric of American Lettering by giving tips, tricks and techniques that provided training for students and professionals alike. With a compelling history presented in the context of entrepreneurial America the early 1900’s, the invention, introduction and branding of this revolutionary writing tool provides a lens with which to view the development of letterforms and their application over perhaps the most important era in the development of our modern culture. In a presentation originally designed for the International Lettering Arts Conference “The Calligraphy Connection” in 2009, “The Why of Art” is a journey that attempts to address the mind of the artist and the evolution of artistic expression. From the medieval guilds to the abstract expressionists, the voice of the artist has undergone transformation throughout the ages. A study of this transformation historically combined with interviews of contemporary artist/calligraphers make for a thoughtful analysis of the differing approaches of the artist towards his or her art. The final section of the talk comprises the progression of Randall’s painting “C.S. Lewis – The Spirit and the Man“, with influences, symbolism and in-progress photos of the painting. Artist Randall Hasson and Poet Christopher Baron entered into a collaboration in the spring of 2010; “The Baron Journals” presentation explores this multi-disciplinary project. With Chris Baron and Randall Hasson, this presentation encompasses both the artists and the poets perspective firsthand. The talk begins with an introduction to Chris’ poetry as he reads selected poems. Randall Hasson then narrates the slides of his sequential artwork, delving into the reasons behind the symbolism, design and execution of the pages. Interspersed with Chris’ poetry, the presentation allows listeners to gain insight and understanding of our calligraphic art from the perspective of one whose words we illustrate. Attendees are encouraged to participate in a Q & A at the end of the presentation. Presentation time: 1 hour 15 minutes, with Q&A following. Randall Hasson tells the story of the collaborative project. With time for the attendees to experience the Baron journal itself, Randall then introduces Chris to the audience via slides and then narrates the slides of his sequential artwork, delving into the reasons behind its symbolism, design and execution. This presentation works well as a guild presentation in connection with either of the Journal Workshops that Randall teaches as it illustrates many of the techniques and textural effects that students will be learning in each course. Detailing the development of a current calligraphic workshop of the same title, this talk goes through aspects of letterform development and exploration with background and influences that brought Randall Hasson to his current facility in calligraphy. Tradition, influence, exploration and innovation came together to develop the current methodology of breaking down and reconstructing non-Latin letterforms into an individual alphabet that is unique to the participant. This workshop, initially taught at an international Lettering Arts conference, lead to a serendipitous meeting with Ibrahim Barry. Here the talk transitions into the story of the invention and implementation of a unique writing system in present day West Africa. With background on the Fulani people and their history, the presentation brings into focus the two brothers from Guinea who decided to create an alphabet for their culture which was almost wholly illiterate. Ibrahim Barry is introduced to take listeners on his journey. From the creation of the original glyphs of the alphabet in 1994 to time spent in jail for publishing a newspaper that the government couldn’t read to the present day teaching methodology, Barry gives a creators’ account of the effects of ADLaM and how this writing system is developing literacy among a widespread people-group in the Sahel of sub-Saharan Africa. The story of the creation, roadblocks and challenges of future technological advances will astonish and inspire listeners. This isn’t a 3,000 year old history, but a living, vibrant and vital movement in our time. The C.S. Lewis presentation encompasses the process of completion of 2 paintings that have a connection. Research, symbolism and the painting process of the C.S. Lewis painting project are detailed in a step by step fashion. This lecture also includes the same process in another painting called “The Evangelist” commissioned by the Hobby Lobby Stores. A unique connection is exists between the two that will surprise and delight the viewer.